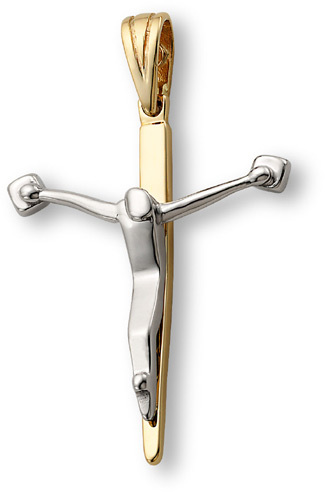 A truly unique 14k two-tone gold crucifix pendant. Measures 1 1/4" tall x 15/16" wide (or 1 5/8" tall with hoop/bail). We guarantee our Modern Crucifix Pendant, 14K Two-Tone Gold to be high quality, authentic jewelry, as described above.